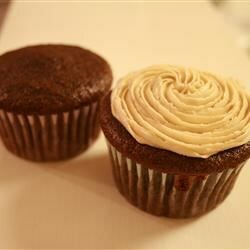 "My husband loves Guinness® so I thought it would be fun to make cupcakes one year for his birthday -- he loves them. Now he gets them for every birthday! They are a nice mellow flavor: not too sweet, yet still chocolaty. Goes great with the espresso frosting!" Preheat the oven to 350 degrees F (175 degrees C). Line 2 muffin tins with paper liners. Combine stout beer, butter, and vanilla extract in a small saucepan over medium heat. Stir occasionally until butter is melted. Pour into a large mixing bowl and set aside to cool for at least 10 minutes. Whisk flour, sugar, cocoa powder, baking soda, and salt in another large bowl. Pour gradually into the beer mixture, beating with an electric mixer on medium speed. Beat in sour cream and eggs, one at a time, until batter is smooth. Divide batter among the lined muffin cups, filling each one 3/4 of the way. Bake in the preheated oven until a toothpick inserted into the center comes out clean, 22 to 28 minutes. Leave in the tins for 5 minutes. Transfer to a cooling rack to cool completely. Meanwhile, make the frosting. Combine powdered sugar and butter in a bowl. Beat on low speed until creamy. Mix water and espresso powder in a bowl until espresso is dissolved. Pour into the bowl and beat frosting on medium-high speed until fluffy. Cover tops of cooled cupcakes with frosting. I usually use 2 to 3 tablespoons brewed espresso. If making mini cupcakes, bake for 17 minutes. If frosting is too thick, add a few drops of water (or more espresso) to get the desired consistency.